Looking for a little slice of paradise where you can relax and rejuvenate? Whether your plans call for a family getaway or a secluded honeymoon trip, Cala Mia is the place where your adventures begin and the memories you create here will stay with you a lifetime. Prices are per night for 2 people in Twin or King Bungalows, or 4 people in the Family Bungalow or Villa Deluxe, and 5 people in the Beach House. Children stay free, when under 5 years old. Additional person plus $50. Maximum persons per bungalow is three, no matter the age. Complimentary use sea kayaks & Paddle Boards. Food & drinks prohibited at the resort. Check-in after 2pm & Check-out 10.30am. Late checkout to 4pm is available for at $50 (includes boat), use of room if available. Free boat In & Out with a 3 night’s stay, otherwise $20 each way based on the Ferry Schedule. Transfer outside the Ferry schedule cost $30 each way. Cala Mia Dock is private and Non Cala Mia or Panama Nautical Club vessels are prohibited from using our dock or marina facilities. Any customers who contract 3rd party services or boats and require use of our facilities will be charged $250 per use. To confirm a reservation, we require 10% payment, with balance due 30 days prior to arrival. For Christmas and New Year’s (from Dec 22 to Jan 4) balance is due 90 days prior to arrival. 90% refund up to 30 days prior to arrival. Refunds paid 30 days after the reservation date. Cancellation policy: Christmas Week (from Dec 22 to Jan 4). We require a minimum stay of 3 nights to guarantee the reservation over Xmas. 90% refund up to 3 months prior to arrival. Rebooking fee of $50 per reservation. Free boat In & Out with a 3 night’s stay, otherwise $20 each way based on the Ferry Schedule. 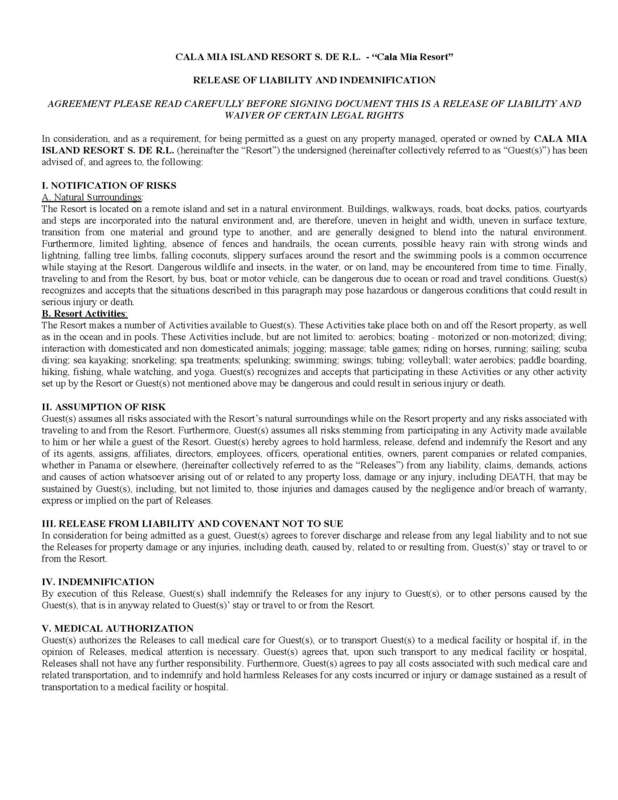 Please note upon arrival to cala mia island resort due to the remote location and the setting being a natural environment you and your travel companions will be required to sign a release of liability and indemnification. 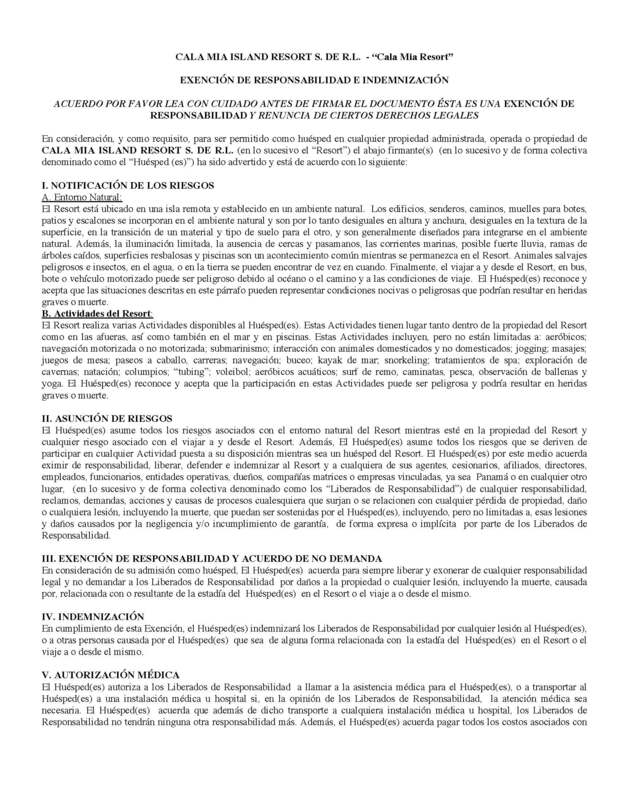 This is a release of liability and waiver of certain legal rights. The copy of the document must be executed on arrival otherwise management can refuse access to the resort. 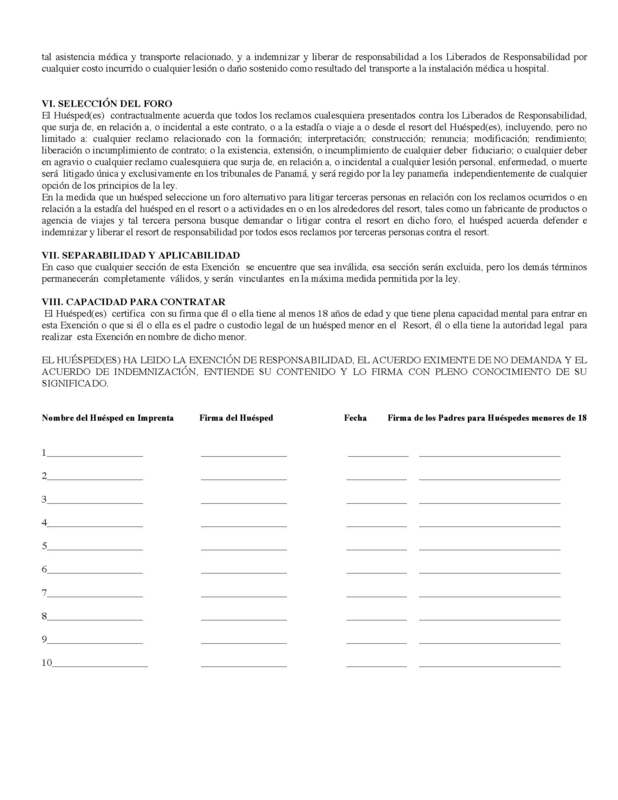 Please click here to read the English waiver document page 1 & page 2 OR here to read the Spanish version page 1 & page 2.